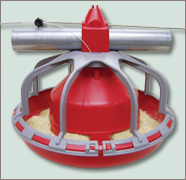 The PXP Turkey Starter Feeder allows for maximum feeding space and easy access for your birds all around the pan. There is no need for individual pan settings as a single winch adjusts all feed pans in a section, supplying the right amount of feed to your poults at all times. 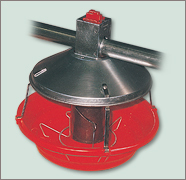 The PTF turkey pan feeder is a multi-adjustable feeder that is easy to handle with excellent results. The ample and deep poly pan offers sufficient space for the growing turkeys, avoids feed waste and can easily be removed, exchanged or cleaned.